disorders are suspected, patients should visit a periodontist for help treating TMJ. The cause of TMJ disorders is often difficult to pinpoint. Patients may have had grinding or clenching disorders which caused the joints to lock up and weaken. Patients may also have damage to the structures around the joint, including the muscles of the face and neck, the cartilage of the face, the ligaments and nerves, and the teeth. Poor posture, stress, and structural misalignments may also lie at the root of disorders and the processes needed for treating TMJ. Why Periodontists Instead of Physicians? Since TMJ disorders cause pain, patients often go to a physician for TMJ disorders. However, physicians may not recognize the symptoms of a TMJ disorder and may not be properly equipped to treat the condition. A periodontist is familiar with TMJ symptoms and will understand the best course of action for treatment. 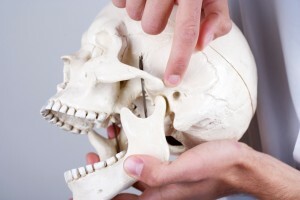 Treatment for TMJ may vary depending on the cause and symptoms of the disorder. If a clenching or grinding issue is at the root of the disorder, periodontists may prescribe dental splints or mouth guards. Anti-inflammatory medications may be prescribed to treat inflammation that is causing TMJ issues. Surgery or corrective devices may be required to fix alignment problems. In some cases, patients have found Transcutaneous Electric Nerve Therapy, ultrasounds, and laser therapy to be helpful. If TMJ symptoms are not severe, physicians may recommend nothing but home treatments. Home treatment may also help to supplement other forms of TMJ treatment. Most home treatment addresses inflammation, using ice packs or over the counter medications to reduce swelling. Massaging of the jaw may help to greatly ease pain and reduce tension in the jaw.